The Residents are a strange band indeed. They have released dozens of albums since 1971, they co-invented the music video, they've not been played on MTV (which shows they must be original), they've done numerous live shows and performances, and still no-one knows who they are. In 1993, The Residents approached Jim Ludtke, an award-winning illustrator and animator who had previously done a video clip for them, with the idea of creating a multimedia CD-ROM experience based on their Freak Show comic book. And thus the first Residents CD-ROM was created. 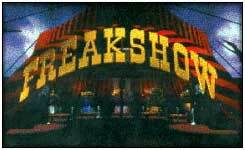 When you first start Freakshow , you are dropped into a freak show tent with a few pitiful, unimpressive attractions. The most interesting part is the last exhibit, a list of 81 real freaks and their stories. The Residents have ensured all these freaks are treated with the proper respect. That sounds like pretty meager content for a whole CD-ROM, and indeed it is -- until you deliberately ignore the pesky owner and go backstage. 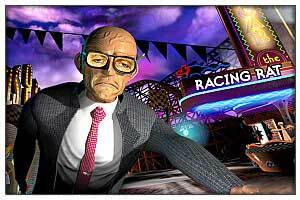 You can visit the trailers of the freaks that star in the game and learn more about their personal lives -- the humans behind the freaks (this technique is also used in the other Residents CD-ROM, Bad Day on the Midway ). This is not a normal adventure game -- you can't die or lose, but you can't win either. You can visit the trailers and explore (and get your fill of The Residents' music, videos, performances and merchandise), learn about the personal tragedies of the stars, then leave. And so, says the closing narration, a freak show is much like life: nobody laughs when they leave. In this multimedia extravaganza, you take on the role of a little boy named Timmy who visits a run-down amusement park. inSCAPE, the company that produced the games, have made sure no two games can be the same, and you won't be able to see the entire story in one play -- or even in ten. 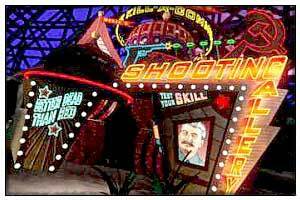 It's best not to approach Bad Day on the Midway as a game, but as a multimedia experience -- try to see as much as you can in one go. If you do, the story will slowly start to emerge. If you don't get anywhere at all, you can watch many of the movies from the Credits screen or directly from the (hidden) ASPDATA folder. While the graphics are blocky and only 256-color, the talent of the various artists like Dave McKean make up for it. The only downside is that there are no subtitles for the sometimes very hard to understand voice narrations. Instead, the lower quarter of the screen displays a stream of consciousness that reminds me of Leisure Town (warning - explicit content). Where can I get those games? If these reviews have made your mouth water, you'd better go and secure copies of these games as quickly as you can -- inSCAPE has been out of business for years, and Freak Show is hard to come by too. Ralph America and EuroRalph are outlets for everything connected to The Residents.